This recipe utilizes a form of braising, the popular French cooking method, often used with meats because the combination of moist and dry heat helps break down tough tissues. The principle is fairly simple: high heat or searing followed by liquid (filled to roughly halfway or two thirds the way up the sides of the protein), low temperature, then covered and cooked slowly. Cabbage works well with this cooking technique because the tough leaves break down, making them softer and somewhat more palatable while keeping the moisture in. The balsamic vinegar adds acidity that is absorbed during the cooking process and complement the sweetness of the apples. These flavors produce a sweet aroma instead of the sour, fermented one often associated with old school conventional cabbage. Cabbage was a staple of my grandmothers time and this recipe was based on one of many cabbage recipes her cookbook, “The Art of Good Cooking.” I have made very few of her cabbage dishes but this recipe has inspired me to make more. I did make a few adjustments to the original such as replacing the red wine with balsamic vinegar and adding onions (another sweet component), but the method remains the same. I served this with simple pan-fried pork cutlets (as seen in my terrible photography – next week’s will be better, I promise). 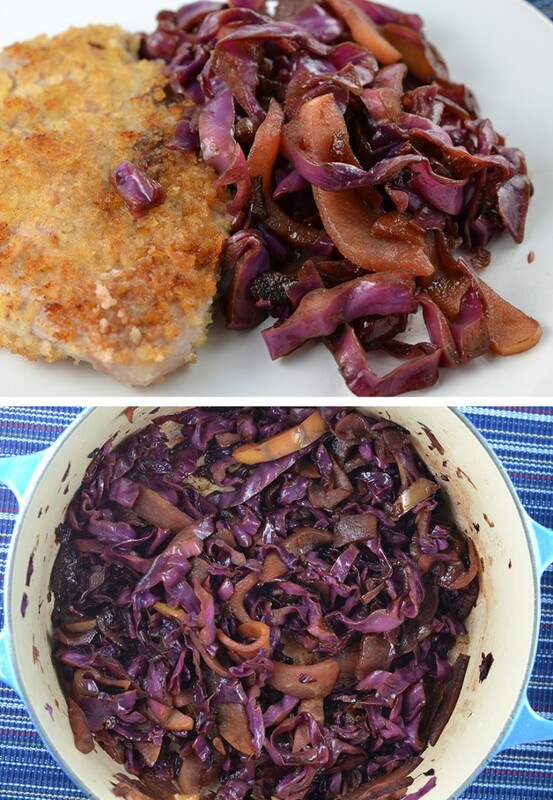 The sweet balsamic purple cabbage and apples complements each bite of the succulent pork. A quintessential fall meal at its best – with a boost from a vintage vegetable that now seems a little less boring and intimidating. Heat butter and olive oil in a large heavy pot, such as a dutch oven, over medium heat. Add the onion and ¼ teaspoon sugar. Saute for 5 minutes or until onion is translucent and starting to caramelize. Add cabbage and cook for 1-2 minutes. Stir and add 2 tablespoons of balsamic vinegar. Cook covered 7-10 minutes until cabbage begins to soften. Add salt to taste and stir. Add sliced apple, lemon zest, and ½ teaspoon sugar. Stir and reduce heat to low. Add remaining balsamic vinegar. Cover and simmer for 20-25 minutes or until the majority of the vinegar has been absorbed and both apples and cabbage are soft. Remove cover and cook for 5 minutes. Check seasoning – add salt and pepper to taste.